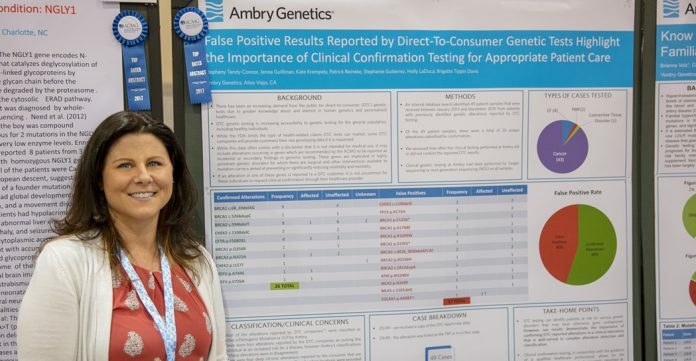 A study by Ambry Genetics researchers showed that as much as 40% of the variants in a variety of genes reported in the raw data of direct-to-consumer (DTC) tests were false positives—a finding that the investigators said raises questions about the accuracy of DTC genetic testing. The researchers analyzed the raw data of 49 patients who were referred to the clinical diagnostic lab of Ambry Genetics for confirmatory testing of variants previously identified by DTC testing between January 2014 and December 2016. The patients previously shared with their medical providers the raw data results from tests carried out by DTC testing companies that were not disclosed in the study, False-positive results released by direct-to-consumer genetic tests highlight the importance of clinical confirmation testing for appropriate patient care, published in the journal Genetics in Medicine. The Ambry researchers found that two out of every five variants noted in the DTC raw data were incorrectly reported and could not be verified by further diagnostic lab tests. In eight instances, according to the study, the variants that were present were misunderstood by third-party interpretation services. Tandy-Connor said that some of the discrepancies in the results may be explained by technical differences between the various testing methods used, and that the study’s relatively small cohort reflected how most people who get such DTC results don't seek confirmatory testing. That cohort of patients was nearly all-female (45 of 49, or 92%), and mostly under age 50 (34 of 49, or 69%) and white (25 of 49, or 51%). For nearly all patients (43 of 49 or 88%), the disease gene analyzed was cancer, followed by cystic fibrosis (4 patients), connective-tissue disorder and familial Mediterranean fever (1 patient each). In five genes (ATM, BRCA1, BRCA2, COL3A1, and COL5A1), the study said, eight variants were designated “increased risk” in DTC raw data or by a third-party interpretation service, even though the variants are classified as benign at Ambry and several other clinical laboratories. Researchers acknowledged that the DTC tests were not diagnostic, and were intended to inform patients about their risks for a limited set of conditions. The study results demonstrate the importance of confirming DTC raw data variants in a clinical laboratory that is well versed in both complex variant detection and classification, the researchers stated. “It is crucial that clinical confirmatory testing be performed on any variants reported in the raw data provided by a DTC company prior to any changes in medical management to confirm the presence of that variant in the individual as well as an accurate classification,” Tandy-Connor and colleagues asserted. “It is important that consumers and their health-care providers are cognizant of the differences in testing methodologies between clinical diagnostic labs and DTC testing labs so that there is no false reassurance or alarm on the behalf of the individual or the health-care provider,” the researchers added. According to the Ambry researchers, genetic testing requires interpretation by a qualified health-care professional in the context of several other factors, such as personal and family medical history. Headquartered in Alison Viejo, CA, Ambry Genetics was founded in 1999 and acquired last year by Konica Minolta for up to $1 billion, in a deal completed October 19, 2017.